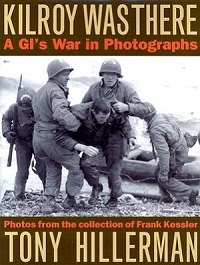 "In 1941 Frank Kessler, a young accountant in Canton, Ohio, was drafted, assigned to an Army Signal Corps unit, and went away to photograph the war in Europe. In 1945, home again with his wife and children, he stored hundreds of those images of blood and battle in his attic. There they stayed until after his death. "Then Lee Kessler, Frank's estranged younger brother, sorted through boxes seeking to better know a brother he'd never known very well. A flier who had been shot down and held in a German POW camp, Lee saw Frank's photographs as images of a different side of war, one he never experienced. He was moved by what he saw and recognized their importance, He preserved them for all of us, carefully ordering them into albums and typing the information Frank had written on the backs of the photos. "When I saw Frank Kessler's photographs I was struck by how different they were from the movie-camera views I see on television. No public relations pictures here, intended to glorify battle and rally support. These were up-close snapshots of the dirty, damp, and disheveled men in the rifle companies and tank units. It was the war as they endured it, as they struggled through it from the beaches of France to the streets of Berlin until they finally won it.